I used to think reblogs were silly. I didn’t understand why people would post them. Were they too lazy to produce their own work? Or was it, sometimes . . . something else? Today, I get it. Today marks history on Shift. This is my first reblog ever (well, sort of—I’m too much of a perfectionist to do things the normal way), and it is for a purpose. Several months ago I discovered an amazing blog by an incredible photojournalist based in Bangladesh. His name is GMB Akash, and his work has been featured in more than seventy major international publications, including National Geographic, Vogue, Time, Newsweek, Geo, The Guardian, The Economist, and more. He has received more than sixty-eight international awards, and every post I’ve read since following his blog has taken my breath away, and even, occasionally, brought me to tears. In “Factories of Death” and his previous post, “Low-priced Slaves,” Akash brings to life a tragedy that, for many of us, seems worlds away. 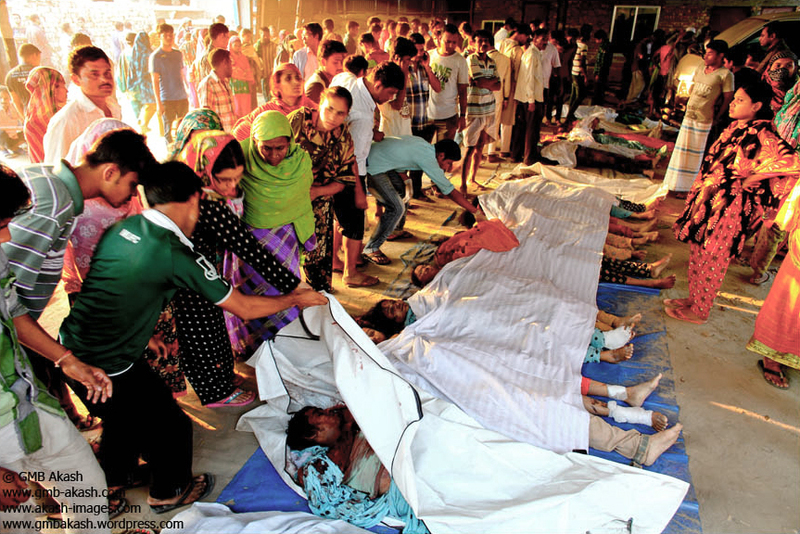 The collapse of the eight-story garment factory building in Dhaka, Bangladesh last month, which left more than 1,100 people dead, is no longer making big headlines here in the States—or in many other parts of the world, for that matter. But that doesn’t mean the tragedy is over. Akash’s photos tell it all: A story of preventable heartbreak and horrible loss, of sadness, anger, strength, and resilience. The people featured are no different than you or than me. The people featured are just like you and me . . . This is why, a few weeks back, I wrote “Let There Be Light.” This is why, sometimes, this world breaks my heart. So please, please, please click on the links above. Please take a moment to check out Akash’s photos. You won’t be disappointed. I promise. Thank you, GMB Akash, for giving a voice to those who have none. Thank you for your incredible work. The world needs more people like you. This entry was posted in culture, current events, life, loss, travel and tagged Bangladesh, Dhaka, Economist, GMB Akash, National Geographic, Newsweek, United States, Vogue. Bookmark the permalink. Chills! Sometimes we live in our own cocoons, detached from humanity. It’s unreal that such devastation exists, and the outcry is not heard as loud. I remember reading about this tragedy and being shocked, wondering what change would be instituted to protect these people. Then I realized that maybe their lives aren’t worth that much to others. What is the value of a human life? Seems like it depends on what part of the earth you’re from. Very, very tragic and sad. The photographer has done a remarkable job of capturing the haunting, lifelessness in the peoples’ eyes. I’m weeping for them.Thanks Jessica for reblogging and reviving this story. You are so right anglophiletoad about forgetting what suffering is unless we’re the ones doing it. I need to see these pictures, read the stories and to hope it energizes me and the world to help in some way. But then you’re right. The sensationalism of the media makes it difficult to know what to believe. Photographers like Akash know how to do it right. If you look at some of his other work, you see gritty photos of people just living their day-to-day lives. This was a horrify montage of photos. I truly am isolated from knowing about these tragedies. It’s truly sad, Terri. You’re right. I especially like reading the stories that go along with Akash’s photos. They bring these images to acute life. We *are* isolate here in our haven. Like I mentioned in my comment to Vance (anglophiletoad), Akash’s images, and not just of this tragedy but of the day-to-day life of people around the world, bring perspective, and, for me, a desire to look outside of myself. I want to help. Thanks for sharing Akash’s work. Now I can see his other work. It is a tragedy of entitlement. I love Akash’s words about dialogue, investigation, and thoughtfulness. If people put the meanings of those words to practice, so much could happen. Once again, thank you for challenging me today. Thank you so much for taking the time to check out his site, Matthew. As I’ve said, I’ve been really affected by all of his posts. His photography is fantastic and brings to life lives so different from our own—these are people who could often use help! Seeing his work always tugs at my heart strings, and, you’re right, Akash’s words bring the pictures to life. It’s harder to walk away from a photo when you know the personal story behind it. I’m glad you liked his site. Thank *you* for your kindness.